200 years later, what's shaking in the New Madrid Seismic Zone? a portion of Geologic Investigations Map I-2812 (US Geological Survey) / Wheeler R.L. Tomorrow marks the St. Louis kickoff of the bicentennial events commemorating the earthquakes that struck the New Madrid Seismic Zone in 1811-12. You’ve probably heard stories about those quakes: that church bells rang in Boston, that the Mississippi River ran backwards. Much of that, it turns out, is legend. So what do we know about the New Madrid fault and the risk it poses to the modern Midwest? It’s a question we’ve been asking lately on St. Louis on the Air and the answer is rather complicated. What we know is that earthquakes have occurred here in the past, large damaging earthquakes… we know that this remains the most active area east of the Rocky Mountains in terms of the number of earthquakes that are occurring and that the rate of those earthquakes is not significantly declining over the years we’ve been monitoring it. For these multiple reasons, there is concern about the potential for future earthquakes. It’s what we call a low-probability, high-consequence event. Just how low-probability is the subject of a new book by Seth Stein titled, Disaster Deferred: How New Science Is Changing Our View of Earthquake Hazards in the Midwest. Stein is a professor of earth and planetary sciences at Northwestern University where he studies the New Madrid Seismic Zone. He and many other seismologists argue that the risk of dangerous seismic activity along the New Madrid is minimal, and that the hazard has been greatly exaggerated by the federal government and by the media. Michael Wysession, Associate Professor of Earth and Planetary Sciences at Washington University, agrees. During his recent appearance on St. Louis on the Air, Wysession held that “the seismological community stands very firmly behind these recent results that the risks of the New Madrid are very low”. 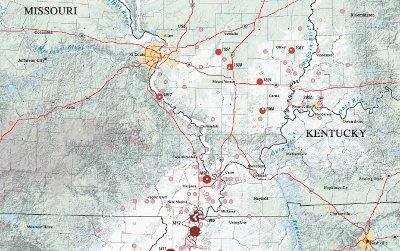 The recent results Wysession referenced are the product of 20 years of GPS data collected along the New Madrid fault. Seth Stein and his colleagues have been measuring motion along the fault, looking for a buildup in strain that could cause a major earthquake. Their data suggests that very little energy is being stored in the New Madrid Seismic Zone, making major seismic activity there very unlikely anytime soon. Stein argues that the small quakes in the region today are more likely aftershocks of past events than indicators of future activity. So how does the federal government use this new data to assess where risk exists? To date, it hasn’t. David Applegate of the USGS called Seth Stein’s GPS data “one of the most interesting new areas of research,” but cautioned that there is “a difference of opinion about how to interpret the results." When the National Seismic Hazard Map was updated in 2008, Applegate says the GPS data was considered, but was deemed “not a defining piece of evidence." Applegate added, however, that the GPS will be reconsidered next time the maps are revised. To listen to the full audio of our discussions about the New Madrid Seismic Zone, visit the St. Louis on the Air archive.